If you've been under the impression that Moroccan stews must include meat or poultry, think again. A delicious vegetarian tagine with mixed vegetables can be prepared as your main dish. 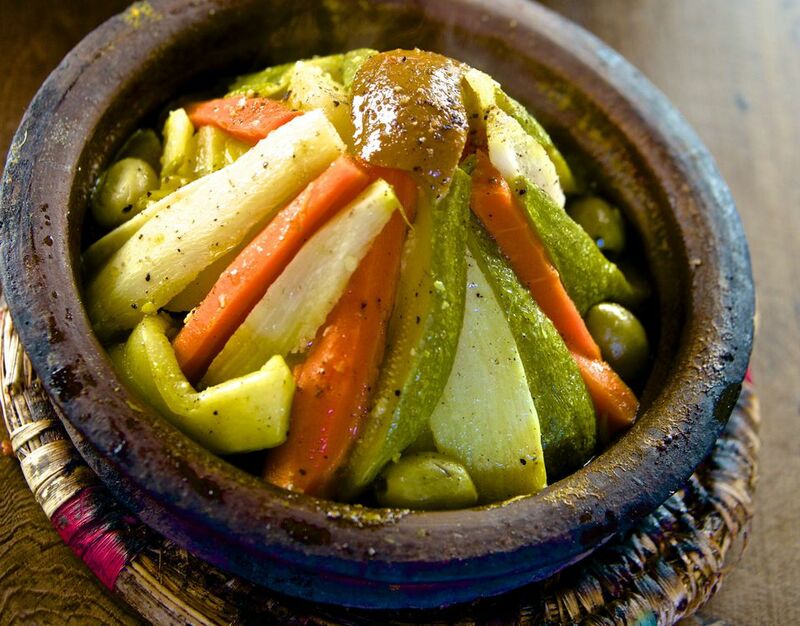 Vegetables cooked in traditional Moroccan tagines have appetizing texture, color, and flavor. Cut the veggies into wedges or planks and arrange them in conical Berber style, or simply slice and layer them. If cooking in a tagine, a diffuser is recommended for placing between the tagine and burner. If you don't own a tagine, a skillet may be used instead. Serve directly from the dish in which you cooked, using crusty bread such as Moroccan semolina bread for scooping up the veggies and sauce. Avoid rushing the cooking; you'll want to allow one to two hours for the veggies to slow cook. If using argan oil instead of olive oil, extra care must be given to maintaining a low temperature so as not to ruin the delicate flavor of the oil. Wash and slice the onion, tomato, carrots, tomatoes, zucchini, and potatoes. Place the carrots, zucchini, and potatoes in a bowl. Add the salt, ginger, pepper, turmeric and optional saffron threads. Toss to coat the vegetables evenly. Pour half of the oil into the base of a tagine or in a skillet. Add the onion slices and top with the tomato slices. Arrange the vegetables in conical fashion on top the tomatoes. First add the carrots, then the potatoes, then the zucchini. Add the optional olives, if using. Drizzle the remaining oil over the arranged vegetables. Rinse the spices from the bowl which held the potatoes by swirling one cup of water in the bowl. Add this water to the tagine or skillet and cover. Place over medium-low to medium heat (use a diffuser between a tagine and the burner) and bring to a simmer. It's normal for this to take 15 or 20 minutes if cooking in clay, so stay patient. Once you hear the tagine simmering, adjust the heat to the lowest temperature necessary for maintaining a simmer. Allow the tagine to cook undisturbed for about one to 1.5 hours. Check to see that the vegetables are tender, and reduce any excess liquid if desired. Garnish the tagine with the chopped parsley or cilantro. Serve the tagine warm and enjoy. Refrigerate any leftovers in a covered container. Enjoy them reheated within two to four days.